The Cotopaxi and Texas Creek areas had extra air traffic this summer, but minimal impact on the local, mountainous terrain, thanks to the local electric co-op. The same was true on the Western Slope when a helicopter was used for power line inspections. It was Sangre de Cristo Electric, headquartered in Buena Vista, which brought the helicopter to the mountain sides along the Arkansas River. The co-op needed to set four 900-pound poles, but the difficult and fragile terrain prevented safe access with typical co-op equipment. So, the helicopter was called in and the job was completed. 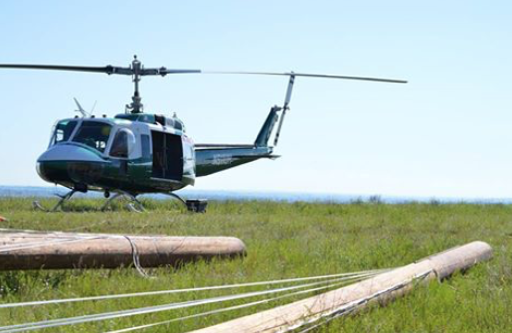 More than 3,000 miles of power lines will undergo aerial line patrol this year as part of DMEA’s system reliability program. Inspections help ensure safe and reliable power to homes and businesses across the DMEA service territory. This use of helicopters is another example of how Colorado co-ops are always looking ahead to find innovative approaches to providing safe, low-cost, environmentally-friendly electricity to their service territories.